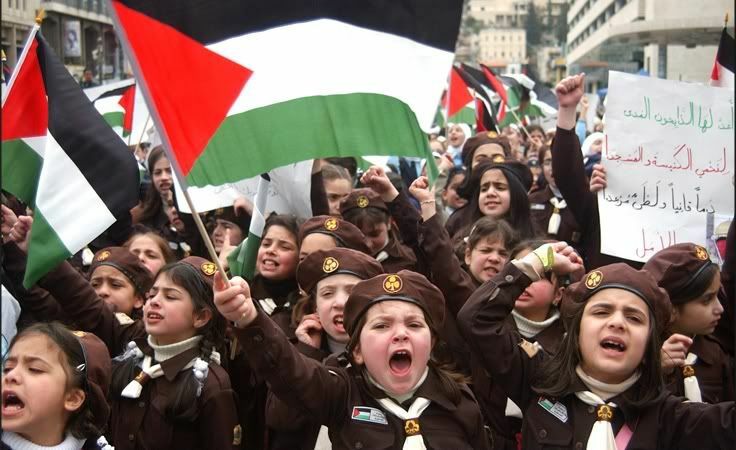 Palestinian schoolchildren participate in a demonstration in support of the new Palestinian coalition government in the West Bank city of Nablus on Sunday, March 18. Children. Have you ever seen such a group of young children in a political outcry like this? It's actually the perfect segway for the next series of serious pieces you'll see from me. I did quite a bit of studying on the Muslim/Islam community, including portions of Palestine and the West Bank....and have intentions of writing out some pieces, along with offering some excerpts from some amazing books. I couldn't resist posting this one, though....take a second to really look at some of the faces. The one I saw was actually almost full screen (you can click to get a little bit larger view), so it was much more powerful, but you get the idea. Wow. It's just amazing how when the rest of my friends are showing me links to stupid Microsoft parodies, you're showing kids in a demonstration. I admire that. Wow. That's a heck of a picture. I can't wait to see your essays and such on the subject; I'm sure it'll be thought-provoking. Here from Blogger'sChoice Awards, glad to see another Gatherite.